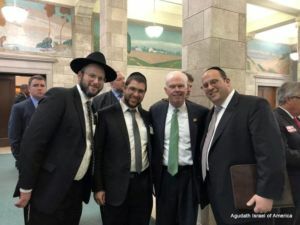 Agudath Israel welcomes the news that NJ Bill S3080, a bill to double nonpublic school security funding, passed unanimously in the Senate Budget Committee yesterday. The funding increase was Agudath Israel’s top legislative priority for this session and was the focus of an intense advocacy effort. Currently, nonpublic schools receive $75 per student in security funding. S3080 and its companion Assembly bill will increase the funding to $150, bringing the per student funding closer to the amount received by public schools. The bill would mean an overall increase of $11.3 million for nonpublic students. Rabbi Schnall expressed his appreciation to the sponsors of Bill S3080, Senators Paul Sarlo, Vin Gopal, and Frank Lagana. Agudath Israel continues to ask its New Jersey constituents to go to its action center and email or call to urge their elected officials to pass the security funding increase. The Assembly version of the bill will be heard in the Assembly Budget Committee on Thursday.